Two of the students in a class that I taught earlier this month brought me some tea. Earlier this month I posted about Darjeeling Oolong Tea and Vahdam High Mountain Oolong Tea which were brought to me by a student from India. For the past week I have been enjoying some tea from Taiwan that was brought to me by a student from Singapore. The tea came in a vacuum packaged bag to keep it fresh. I was able to translate the label with my Universal Translator, but it only gave me information about the store where it was purchased. The translation app did not work so well on the characters that gave the name of the tea. I asked Erik who brought me the tea, but he was also unable to decipher the characters. So, I used my resources and sent a picture to some of my Chinese colleagues. Both Agatha and Carol from Shanghai sent me a translation. The tea is from DaYuLing in Taiwan. 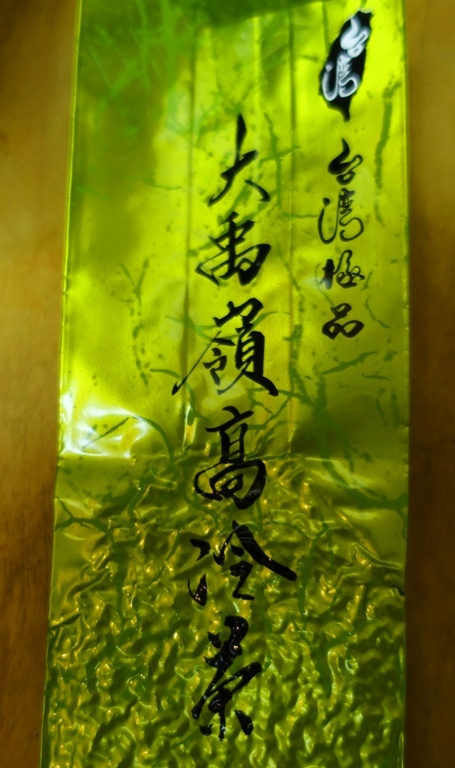 It is an oolong tea that is grown at an altitude of over 2,000 meters. There are only a few areas where tea is grown at a higher altitude. Here is a look at the tea. You can see the little tightly rolled balls of leaves. Each of these will slowly unroll during steeping. 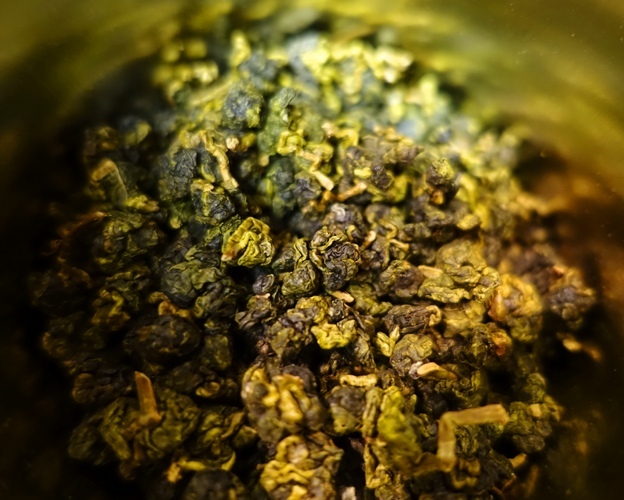 The DaYuLing tea is lightly oxidized so is closer to a green tea than the oolong teas from India which are closer to a red tea. 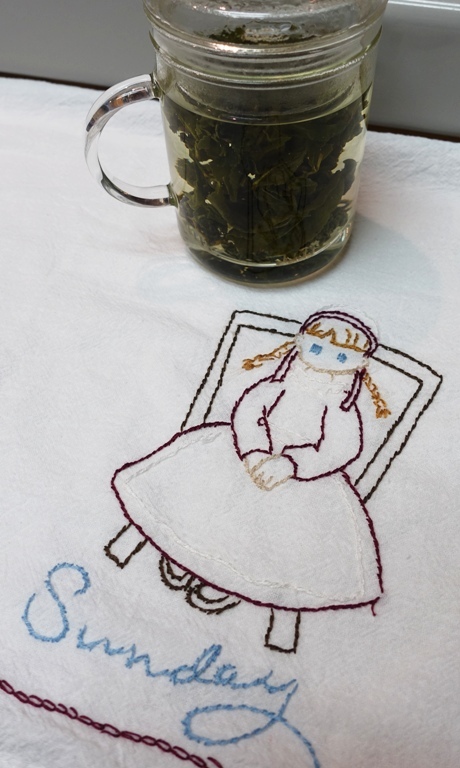 You can see by the tea towel that I used that I first tried the DaYuLing tea last Sunday. In the infuser you can see that the tea leaves have unrolled, but the water is not yet changing color. The tea had a nice golden yellow color and a nice aroma once it was infused. The color darkened a bit as it cooled and also later infusions were a bit darker. The dry aroma is a bit sweet and nutty and it has a tropical floral smell when it is infused. The taste is a bit sweet and mellow and has some floral tones. The mouth feel is very smooth with no harsh edges. There is a nice lingering aftertaste in the early infusions which reduces slowly. When first trying a lightly oxidized oolong I like to see how many infusions I can get as the taste slowly changes with each one. I have lost count, but I can get at least 6-8 good infusions before it really starts to lose flavor. The best infusions are the second and third as the leaves have had a chance to fully open and start to develop flavors. Often the first infusion of an oolong tea is thrown out, but I always like to at least give it a taste. This is definitely one of the better teas that I have in my collection. 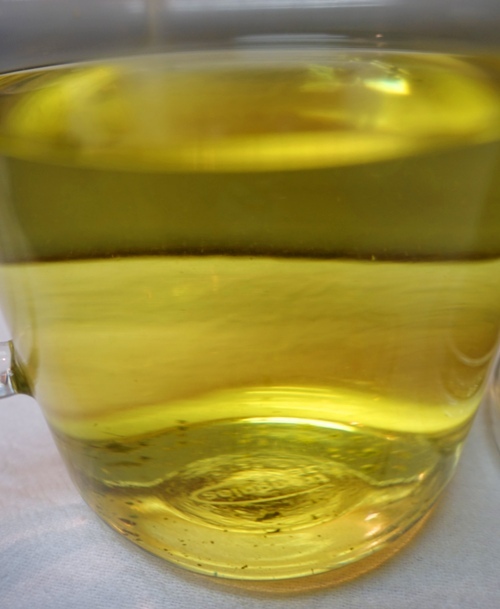 This entry was posted in Culture, Food, Tea and tagged Chinese Characters, DaYuLing Oolong Tea, High Mountain Tea, Oolong tea, Oxidized, Taiwan, Translation. Bookmark the permalink.